CHICAGO – The visual density of today’s animation reaches a new height in a rare Walt Disney Studio sequel, “Ralph Breaks the Internet.” This is a follow-up to “Wreck-It Ralph,” a huge animated hit film. Returning to guide the sequel, which has Wreck-It Ralph “inside” the internet, are co-directors Phil Johnston and Rich Moore. Also returning for the sequel are a number of the voice actors and characters from the first film, including the saucy-tongued Vanellope (voiced by Sarah Silverman), Felix (Jack McBrayer), Calhoun (Jane Lynch) and John C. Reilly as Ralph… also joining them in this new outing is the new character of Shank (Gal Gadot). The story involves the arcade that Ralph and Vanellope live at (in their respective video games) and an accident that changes everything. To try and fix the situation, R and V will have to conquer a new frontier… the internet and the world wide web within it. 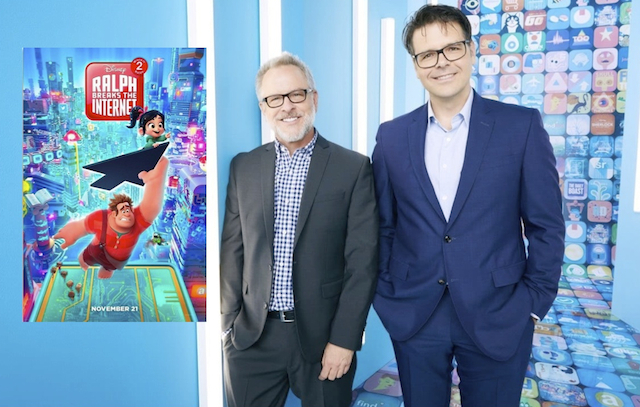 The animated internet universe that comes alive is due to two of the original creators of “Wreck-It Ralph,” Phil Johnston and Rich Moore. This dynamic cartoon film duo took a break between the “Ralphs” to also help create a little Oscar winning film called “Zootopia.” Phil Johnston teamed with veteran animation director Rich Moore (“The Simpsons,” among others) as a contributing writer on the first Ralph and Zootopia, and also co-wrote the screenplay for the current Ralph, along with taking the co-directing reins for the first time. Johnston also scripted a notable independent feature called “Cedar Rapids,’ a film in which John C. Reilly was a main character.